The questions that are being settled on the streets of Egypt are of concern to everyone. The paramount one is this: can a people’s revolution that is determinedly democratic, grassroots, inclusive, and peaceable succeed? Cairo erupted during eighteen days between January 25th and February 11th, 2011. It was one of the first in what became the string of global protests that were held in 2011 & early 2012. That chain included the Tunisian “Jasmine” Revolution; America’s Occupy Wall Street (the OCCUPY banner of which was taken up by groups in England, Germany and Ireland, among others); the 15-M Movement in Spain and the protests in Italy and Greece. Most of these movements continue barely acknowledged by the media. The common cause of the protesters: income inequality. In the West this was and is represented by the banking system and finance industry – the ubiquitous 1%. Government corruption are also being targeted. And while most of these protests began peacefully, few have ended so. Ahdaf Soueif is perhaps best known for her novels In the Eye of the Sun and The Map of Love; and her marriage to the late author Ian Hamilton. She is also a journalist, translator, and political activist who calls both London and Cairo home. Her son, Omar Robert Hamilton, is a filmmaker and a founding member of the activist media collective Mosireen. 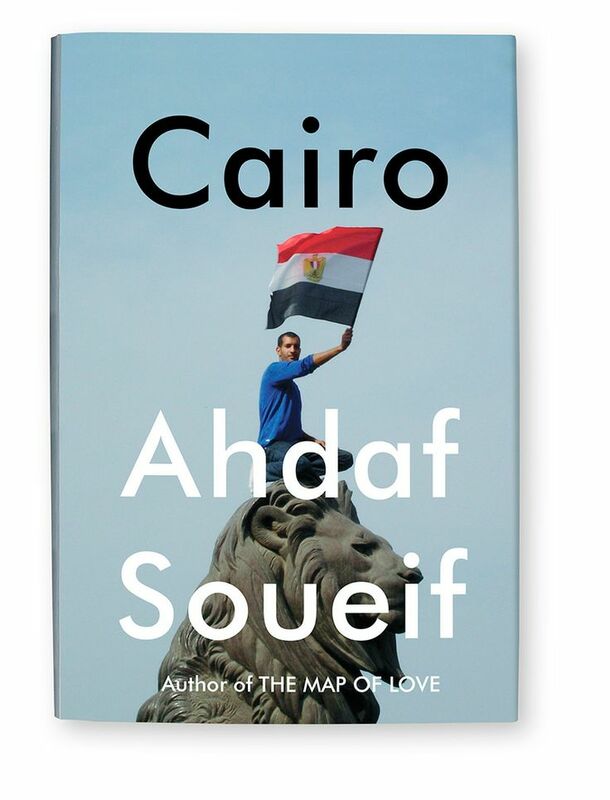 Cairo: Memoir of a City Transformed expands on her earlier account of the 2011 Egyptian Revolution Cairo: My City, Our Revolution, published in 2012 by Bloomsbury UK. This new edition includes a final chapter entitled “Eighteen Days Were Never Enough”. What happened during those original eighteen days? The Egyptian people, led by the Egyptian youth (Shabaab) , descended on Tahrir Square demanding that Mubarak step down and Democratic elections be held. The political factions – and they were many – formed a temporary truce in support of the greater good. The Egyptian Army stood with the protesters. At least for a time. Mubarak’s people sent wave after wave of attacks, sometimes covertly through saboteurs who infiltrated the Square. Many young people were injured or killed. Their leaders were imprisoned. Throughout this time, Tahrir Square was transformed. Much like Zuccotti Park in NYC, it became a campground, a festival and a political stage. Both books seem to be based on the journals and notes Soueif kept as events were happening; she frequently refers to her determination to act as a witness But her writing is more polished, more novelistic, than a simple journal entry. Her words lack the immediacy of a true, first hand report. Ms. Soueif narrates in over-ripe prose; managing to capture all of the romance, exuberance and child-like euphoria of those early days of revolution. Every moment is saturated with portent and emotion. Her family members stride, godlike across the pages – often appearing and acting as a collective. The scenes where she describes them coming together take on the characteristics of the magical realism genre. As in the scene where they celebrate her nephew’s release from prison and the birth of his son (the newest member of this tightly knit family). This isn’t meant as a negative criticism – quite the opposite. Cairo is the antithesis of what we’ve come to expect from the political book. The novelistic quality – the over exuberance – of Soueif’s narrative voice is precisely what makes it so accessible and addictive. It balances the obvious care taken revising and re-editing the text. There is even a post-modern element – Soueif is very aware that the present in which these words are being read is different from her present. That her readers exist in an uncertain future. And so we follow the author as she moves between Tahrir Square, the various homes and offices of her family and the news studios from which she sends out dispatches to contradict the “official” reports being released by the government. There is an emotional investment in what is happening – remember, these are her children and this is her city. Souef’s son, nieces and nephews, sisters and brothers, friends and neighbors all play a part. Her worry and pride is palpable, stirring the same in her readers. While her generation is involved, the 2011 Revolution is primarily led by the Shabaab. They are the front line. And there are times when the streets surrounding the Square were a war zone. For those who only know Soueif as a novelist, Cairo is a vivid reminder of her roots in journalism. She possesses the ability to step back and recognize the larger implications of what is happening in her home country. And so she interrupts herself (in a chapter called, appropriately, “An Interruption”. Interjecting from 18 months in the future to report on the current state of the Revolution. The format is the same one she uses throughout the entire book. The narrative loosely organized into days and hours. But the exuberance is momentarily gone. The movement’s leaders, many of the same nieces as nephews who we stood in the Square with a few pages ago, are now being accused and arrested. Fissures are forming between the different political parties. The population of the city is growing weary of the interruptions to their lives. A lot has changed. Soueif acknowledges that even more time has passed for the reader. That even more changes of which she is unaware will occur. “You… are in a future unknown to me”. And of course she is right. In the present we know that Mubarak was forced out, that general elections were held and Mohamed Morsi became Egypt’s first democratically elected president. In June of 2013 public protests were held calling for his resignation and in July he was forcibly removed by a military coup. Adly Mahmoud Mansour was appointed interim president. The military has in recent months begun a crackdown on leaders of the 2011 revolution and Morsi is facing charges of incitement of murder, violence and of espionage. A police station in Mansoura was bombed on December 24th and the government is declaring the Muslim Brotherhood responsible (despite the group’s denials). They’ve been labeled a terrorist organization in Egypt. The network that ran Mubarak’s security state, by many accounts, is back. Violence swells, breaks and recedes for a time, only to swell again. And readers outside of Egypt are left trying to sift the news for truth. For those interested in learning more, the New York Times publishes up to date news on events in Egypt here. You can follow Ahdaf Soueif on Twitter @asoueif and her son, Omar Robert Hamilton, @ORHamilton. Whether or not you subscribe to the theory that the digital age is creating an ADD society (there was a great article about this last month in The Guardian) time is at a premium in today’s world and there’s no arguing the attractions of shorter fiction. Earlier this year I ran a series of posts featuring bloggers discussing why they love – or hate – short stories. Novellas are also growing in popularity. Readux Books, the new publisher based in Berlin, has hit the sweet spot somewhere between the two with the release of their first collection of books this past October. A lot of care has obviously gone into the making and launching these books. Each is approximately 5,000 to 10,000 words – a length Readux feels is in keeping with “reading habits in the digital era, without room for slack, but that is long enough to allow complex themes to be developed.” The gorgeous, brightly colored paperback covers referencing the German Expressionists. The writing is experimental – of the four books, three are translations – yet accessible. Readux has obviously made clever choices and taken some calculated chances in the planning stages. And while each of the four books is sold individually, they share common themes, ideas and a consistent packaging that had me coveting them for my bookshelves. This careful curating reminds me of some of my favorite independent publishers: New Directions, Open Letter and Other Press. The two non-fiction titles are memoirs about life in Berlin, written from two different periods in the city’s history. Yet, the Berlin described appears remarkably unchanged despite an 85 year gap in the timeline. The changes in writing styles are much more drastic. 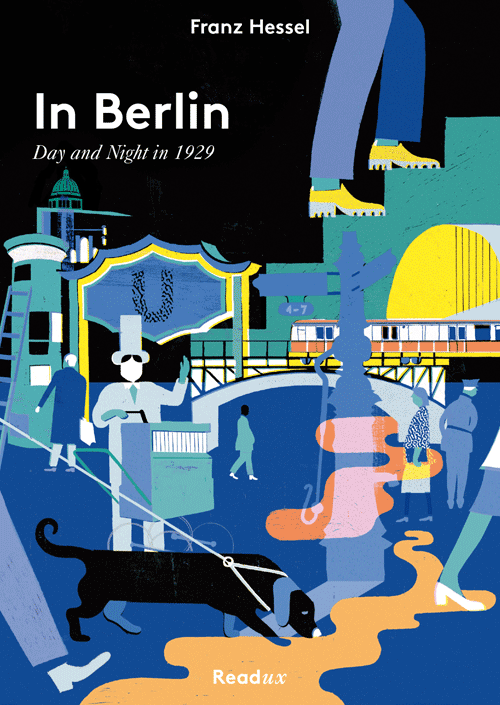 Franz Hessel’s In Berlin: Day and Night in 1929 lacks the post-modern trappings of City of Rumor: The Compulsion to Write About Berlin (written by Gideon Lewis-Kraus in 2013). The former is a period piece that is similar to Christopher Isherwood’s Berlin Stories. Not surprising, as both he and Hessel lived in Berlin at the same time. It’s not unthinkable that they would even have traveled in the same circles. Hessel was a Jewish editor, author and translator. He was a member of the German artist community. His complicated marriage to the journalist Helen Grund inspired Henri Pierre Roche’s novel Jules et Jim (which, in turn, inspired the 1962 François Truffaut film of the same name). Eventually, he would flee Germany for France and he and his son would be sent to an internment camp. He died in 1941, the same year he was released from the camp. But here Hessel is writing about the heady days before the tragedy of WWII. His descriptions of Berlin and its citizens are frenzied and entertaining. In Berlin is an all too brief excerpt of what I believe must have been a longer piece in which we readers get to follow Hessel and his companions as they drift between cabarets, parties and clubs. We meet the German equivalent of Flappers and get a taste of the sexually progressive atmosphere that permeated the city at that time. The sharp, witty prose style is characteristic of Lois Long’s column for the New Yorker during the same period. … Gert and Maria deliberate on what else we could undertake to do. “Why don’t you young people go upstairs and dance?” I ask. “I don’t want to,” says Maria, “but maybe Gert would find some companionship in the Blaue Salon.” “Actually I was supposed to stop in to Ambassadeurs today at midnight.”” In my inexperience, I am informed that this is the newest extension of the Barberina. Gert and Maria then discuss the quality of the various jazz bands and tango groups in the big hotels, in the Palais am Zoo, in the Valencia, etc. I somewhat timidly introduce my experiences from the little Silhoette. “why don’t we just go across the way here to Eldorado? That’s where the real bedlam’s at. You’re all for chaos, smoking and sport jackets, transvestites, little girls, and great ladies, aren’t you? Of course you’re more for what’s proper, Gert, you want elegant dancing and limits, you want to go to Königin.” But in the end we decide on something completely different. If you’re in Germany you can buy a set of (4) posters featuring Readux covers. 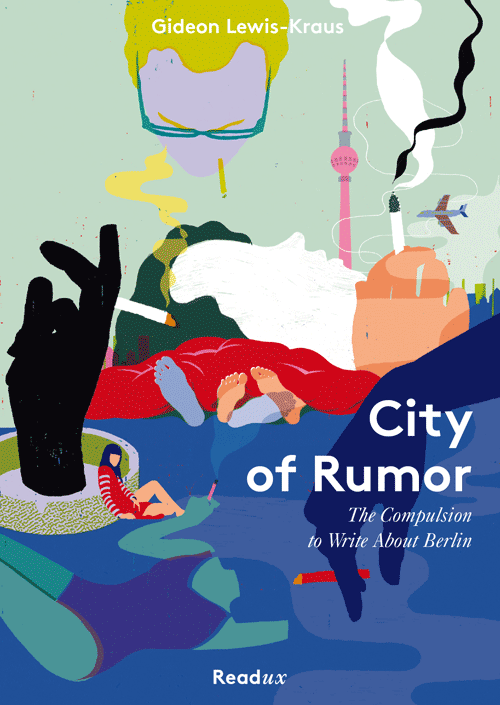 In contrast, City of Rumor by Gideon Lewis-Kraus spends less time writing about Berlin, the city, and more on his conflicted emotions regarding it. He is a modern-day expatriate. Lewis-Kraus is an American journalist whose work has appeared in Harper’s, GQ, The New York Times Magazine and the London Review of Books. His writing is as beautiful as Hessel’s, but also more fraught. The modern Berlin he describes is still a frenetic party scene, but seems less innocent and more world-weary. The essay, itself, reads much more self-indulgent; the main conflict being internalized. Berlin assumes the secondary role, stripped of its unique character and becoming interchangeable with cities like Brooklyn, London or L.A. “Hipster” is a word that comes to mind. “Angst” is another. Of course, the subtitle is “The Compulsion to Write About Berlin“, – so you could say that Lewis-Kraus has delivered on what was advertised. The chapter about Berlin, like the lives of man of the people I knew in Berlin, had no such constraint – no relevant chronology, no narrative necessity. When I sat down to write about Berlin for the first time, all I could do was make a list of anecdotes, the ones that had lingered with me for some reason, in no particular order. I wrote them out as a series of disordered episodes – the time we followed the votive candles to the rave in the toolshed in the middle of the park, the time our friend held a real art opening outside a fake art opening – and saw little use or accuracy in connecting them. After all, they had only ever felt associatively connected in the first place. They had, or course, happened in one particular order, though as far as I could tell they might very well have happened in any other order, or no order at all. Side-by-side these essays seem not about Berlin but instead about two generations of young urbanites. That contrast between authors is what I found most interesting. Individually they’re entertaining reads – but considered together they have the potential to spark a larger conversation about historical, cultural and literary changes. The two fiction titles are Fantasy by Malte Persson, translated from Swedish by Saskia Vogel and The Marvel of Biographical Bookkeeping by Francis Nenik, translated from German by Katy Derbyshire. Welcome to Bare Facts: a new, monthly *crosses fingers* feature for 2013 which is all about non-fiction. The books reviewed in Bare Facts are intended to help provide a historical, geographic and political context – with subjects ranging from international history, politics, personalities on the world stage, religion, philosophy, etc. “The Great Game” is the term used for the 19th and early 20th century struggle between Russia & Great Britain for control of the Middle/Near East. Sean McMeekin’s book, The Berlin-Baghdad Express, examines the period surrounding the first World War, when Germany made their play at the region through strengthening their relations with the Ottoman Empire and building a railroad that ran from Berlin to Baghdad. You’ll want to keep a map at your elbow while reading this book. A warning: train and railroad enthusiasts should contain their enthusiast because the title is somewhat misleading. It refers to McMeekin’s premise that Germany & the Central Powers’ failure in the region was in a large part the result of their inability, due to geography and political conflicts, to build a continuous rail network between Berlin and Baghdad. Unfortunately, as I just demonstrated, you don’t need 400+ pages to make this point. 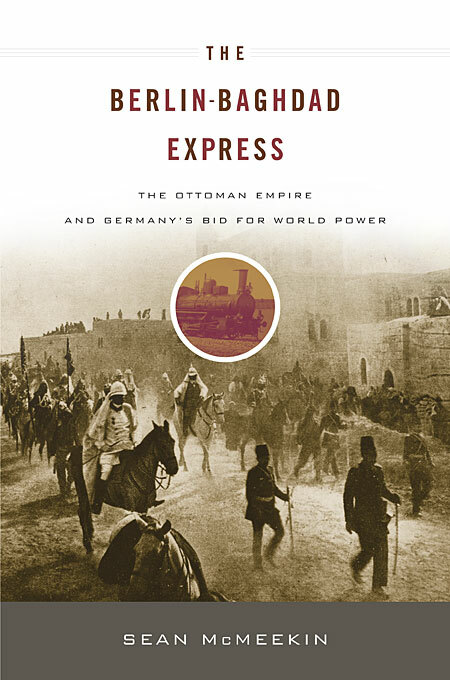 So, while some discussion happens at the beginning and the end of the book, the bulk of The Berlin-Baghdad Express: The Ottoman Empire & Germany’s Bid for World Power focuses on the complicated (and often preposterous) German machinations to incite a global jihad. The Porte – the governing body of the Ottoman Empire – had recently been taken over by a group known as the “Young Turks”. This new, progressive government attempted to put the nation on a more secular path. In an attempt to reach his goal, the “sick old man of Europe” decided to throw his lot in with the Central Powers. And while it played the board surprisingly well, the Ottoman Empire was in a tenuous situation from which it never managed to escape. Germany and the British actively courted the Porte with gold and weapons, but Russia was a constant threat in the East. The reality was that the “sick old man” was never viewed as more than a pawn in the Great Game played by these three powers. Albeit a well-payed pawn. (I particularly like this cartoon from Punch Magazine, showing the Kaiser loading a cannon with a shell representing Turkey – which pretty much shows the situation Turkey found themselves in). But what a game it was! Berlin-Baghdad Express is filled with fascinating historical minutiae – the kind of spy vs. spy drama seemingly more suited to a John LeCarre novel than something published by Harvard University Press. (McMeekin is all too aware of the genre element in his story and makes frequent references the novel Greenmantle by John Buchan). No author could ask for a more romantic period or place – this was the time of Lawrence of Arabia and the setting for the Indiana Jones films. A colorful cast of whirling dervishes, sheiks and sultans, Bedouins and dragoman, archeologists and Orientalists, traipse across the page. At one point even “the Duke of Westminster made an appearance, commanding a ‘Light Armoured Car Brigade’ which included ‘six armoured Rolls-Royces mounted with machine guns’. The failure of Germany rested on more than an incomplete rail system. Despite having what they thought were the necessary men on the ground, Orientalists who (like Lawrence) had supposedly “gone native”, there were still large holes in German understanding of how the Muslim religion operated. Only after it was too late did they understand the subtle but important differences and delicate relationships between different sects (Shia & Sunni), tribes and – perhaps most importantly – between Arabs & Turks. The following extract is wordy, taken from two separate chapters of the book, but it eloquently explains the opportunistic way in which the European powers attempted to manipulate their supposed allies. That the Germans wore rose-colored glasses is an almost comical understatement of the situation. Despite his own holy war promises to Kaiser Wilhelm, in October even Enver had cold feet about issuing a full-on global jihad declaration, for fear the Germans, too, would be ensnared if it were taken literally. The result was a ‘proclamation of holy war against all Europeans with the exceptions of Austrians, Hungarians, and Germans’ – was something of a mess, neither uncompromising enough for the Germans, nor theologically proper enough to satisfy Muslim clerics. Read literally, moreover, it meant that citizens of neutral countries could be targeted. So, too, could Belgians, who were specifically named in Ottoman jihad decrees, and Serbians. By contrasts, US citizens resident in Turkey were specially exempted, along with employees of American missionary colleges…. …Considering how much blood, arms and treasure the Germans had invested in summoning up the ancient spirit of Islamic holy war to bring down the Entente empires, one can understand the creeping sense of disappointment for each successive failure of Oppenheim’s jihad to ignite. But a true scholar of Islam could have told the Germans exactly what to expect. As infidels themselves, the Germans could hardly summon up a holy war on their own. In terms of Islamic jurisprudence, the notion of selective jihad against some, but not all, Christians, as we saw in chapter 6 above, is nonsensical. On the other hand, the practice of infidels paying for protection – as the Germans, in effect, were doing each time they asked Muslims to spare them while attacking other Christians – is firmly established in Islamic law. The theological grounds for this jizya, or compulsory tax paid by non-Muslims, is explained clearly in the Koran, Sura 9:29: ‘Fight those who believe not in Allah nor the Last Day, nor hold that forbidden with hath been forbidden by Allah and His Messenger, nor acknowledge the religion of Truth (even if they are) of the People of the Book [i.e. Christians and Jews], until they pay the Jizya with willing submission, and feel themselves subdued’ (emphasis added). German requests for Islamic fatvas and jihadi uprisings against the Entente powers may not have been conceived in Berlin as jizya offerings, but that may have been just how they were interpreted by many Turkish, Arab and Persian imams and clerics. The product of ignorance? A lot of gold was spent in the Middle East during the period between 1914-1915 to negligible effect. The book’s final chapters carefully explain the context and future repercussions of these events. Because WWII is essentially the lynchpin of 20th century history, McMeekin takes the time to discuss how the German’s cynical attempt to incite a targeted jihad was a precursor to the anti-Semitism of not only the Holocaust, but the attitudes that exist in the Middle East to this day. He shows how Zionism, a movement which actually began in Germany, was embraced/co-opted by the British. He deals with the Russian situation: where the Central Powers successful nurturing of the Bolshevik Revolution produced results beyond their wildest dreams. Thankfully, The Berlin-Baghdad Express goes far beyond how for lack of proper train schedules a war was lost.